In nature, plants are exposed to many anomalies that cause severe metabolic disturbances and very often an installation of the disease. These anomalies are either climatic (low or high temperatures) or anthropogenic (heavy metals and pesticides) and are called abiotic stresses. In contrast, biotic stress involves a second living being known as a pathogen (fungus, bacterium, mycoplasma, virus, and viroid) or others (mites, insects, mollusks, nematodes, and herbivores). Plants attacked by a pathogen develop complex defense strategies (hypersensitive reaction and acquired systemic resistance) and often effective to cope with the anomaly. The suppressive effects on biotic stress agents, often observed during the use of organic amendments, open up horizons of new perceptions. Some of the living organisms that live in the organic amendments are also known to inhibit soilborne disease and phytopathogenic nematodes. However, it is only gradually that we begin to understand under what conditions they can be developed and following what approach they can be efficient. 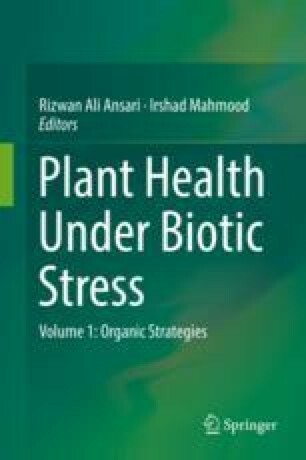 Different control approaches propose control of biotic stress by the suppressive effect of organic amendments from plant and animal sources such as compost. Nevertheless, not all the organic amendments have the same ability to effectively inhibit biotic stress agents. The variability observed between the effects of different organic amendments is undoubtedly the biggest obstacle to their use on a large scale. In general, the suppressive ability of organic amendments to plant diseases has been linked to their chemical composition, the bioavailability of their nutrients, and their microbial consortium due to both supply of microorganisms and nutritional stimulation of those in the soil. Lu, Y., Rao, S., Huang, F., Cai, Y., Wang, G., & Cai, K. (2016). Effects of biochar amendment on tomato bacterial wilt resistance and soil microbial amount and activity. International Journal of Agronomy, 2016., Article ID 2938282, 10 pages. https://doi.org/10.1155/2016/2938282.